The always online digital “things” (cars, houses, machines etc.) equipped with sensors and “digital enterprises” externalized their customer-facing processes, democratized them and made them available to consumer’s apps and partner’s ecosystem via API. Besides, each of the new generation of millennials has a “digital reflection” in the social media that can be targeted as a potential customer. Another way to get things done is via Case Management. This approach lies somewhere between projects and processes: more structured than the former but less than the latter. Case tasks are defined on the fly by a human performer which is less efficient than automatic tasks assignment by a process engine but on the other hand - more flexible. And what’s probably most important, process management requires significant analysis, design, implementation and testing efforts before the first process instance can be launched. Case management doesn’t imply this burden – with proper tools at hand, one can do a job literally in a day. Are processes, projects and cases really that different? Processes, projects and cases overlap – as an illustration, PMBoK (Project Management Body of Knowledge) talks more about standard processes that constitute the project work than about projects per se. Yet historically they were treated as separate management disciplines with separate schools, certifications and supporting tools. Today, the border between project and process work blurs. Example: a multinational pharmaceutical company historically used to treat the new drug development as a project. Each such project lasts nearly 3 years and there are about 600 projects run concurrently. A dozen of managers at the Project management office heavily used MS Project to control them. Then one day they come to the idea of a project template. Finally, they realized that the best template is a process template. Now, all routine job of controlling the task sequences, inputs and outputs is done by the “robot” – BPMS engine and project managers are focused on bottlenecks, delays and escalations and on the ways to further increase efficiency and effectiveness. It may look obvious when it’s done yet it was hardly possible for the company to utilize the process management from the beginning because they didn’t have the required internal capabilities and what’s probably more important, they didn’t have a clear understanding of how the work is done. Every company needs certain time to find its “business recipe” – who should do what, when and how to deliver maximum value to the consumer while utilizing the available resources most efficiently. Another example is the architectural institution developing both single building blueprints and (re)development plans of city districts. This work is managed by a composition of project and process management methods. The governing body is historically called Project Office, yet they are both project and process professionals. It’s commonly agreed today that research, development and other so-called “knowledge work” requires more than just a process approaches. And even if e.g. the core operations are strictly process job, changes of this process are projects/cases anyway. 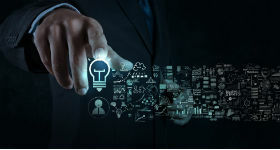 To reach the level of business agility required by Digital Transformation, the full range of process, project and case management methodologies, techniques and tools must be engaged and the traditional borders between them must be eliminated. About the Author: Anatoly Belaychuk has over 20 years of professional and managerial experience in software and consulting industry. He is acknowledged BPM (Business Process Management) expert, writer, key speaker at BPM conferences, blogger and trainer. His current position is as a BPM Evangelist at Comindware.